"No taxation without representation" is a slogan originating during the 1700s that summarized one of 27 colonial grievances of the American colonists in the Thirteen Colonies, which was one of the major causes of the American Revolution. In short, many in those colonies believed that, as they were not directly represented in the distant British Parliament, any laws it passed affecting the colonists were illegal under the Bill of Rights 1689, and were a denial of their rights as Englishmen. 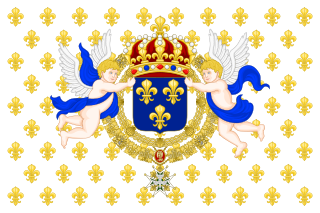 The Pacte de Famille is one of three separate, but similar alliances between the Bourbon kings of France and Spain. The Kingdom of Mysore was a kingdom in southern India, traditionally believed to have been founded in 1399 in the vicinity of the modern city of Mysore. The kingdom, which was ruled by the Wodeyar family, initially served as a vassal state of the Vijayanagara Empire. With the decline of the Vijayanagara Empire, the kingdom became independent. The 17th century saw a steady expansion of its territory and during the rule of Narasaraja Wodeyar I and Chikka Devaraja Wodeyar, the kingdom annexed large expanses of what is now southern Karnataka and parts of Tamil Nadu to become a powerful state in the southern Deccan. Whigs in Britain had long opposed the pro-war Tories in Parliament, and the surrender gave them the upper hand. In early 1782, Parliament voted to end all offensive operations in America, but the war continued overseas. Britain remained under siege in Gibraltar but scored a major victory over the French navy. 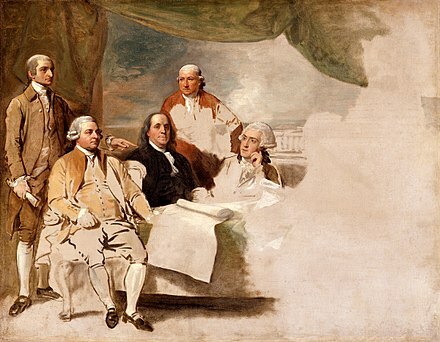 On September 3, 1783, the belligerent parties signed the Treaty of Paris in which Great Britain agreed to recognize the sovereignty of the United States and formally end the war. French involvement had proven decisive,  but France made few gains and incurred crippling debts. Spain made some territorial gains but failed in its primary aim of recovering Gibraltar. The Dutch were defeated on all counts and were compelled to cede territory to Great Britain. In India, the war against Mysore and its allies concluded in 1784 without any territorial changes. The rights of Englishmen are the perceived traditional rights of citizens of England. In the 18th century, some of the colonists who objected to British rule in the British colonies in North America argued that their traditional rights as Englishmen were being violated. The colonists wanted and expected the rights that they had previously enjoyed in England: a local, representative government, with regards to judicial matters and particularly with regards to taxation. Belief in these rights subsequently became a widely-accepted justification for the American Revolution. Virtual representation refers to the idea that the members of Parliament, including the Lords and the Crown-in-Parliament, reserved the right to speak for the interests of all British subjects, rather than for the interests of only the district that elected them or for the regions in which they held peerages and spiritual sway. 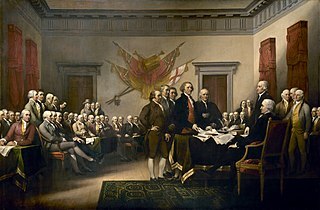 Virtual representation was the British response to the First Continental Congress in the American colonies. The Second Continental Congress asked for representation in Parliament in the Suffolk Resolves, also known as the first Olive Branch Petition. Parliament claimed that their members had the well being of the colonists in mind. The Colonies rejected this premise. In the colonies, the success of Thomas Paine's pamphlet Common Sense had boosted public support for independence. On July 2, Congress voted in favor of independence with twelve affirmatives and one abstention,  issuing its declaration on July 4. Washington read the declaration to his men and the citizens of New York on July 9,  invigorating the crowd to tear down a lead statue of the King and melting it to make bullets. British Tories criticized the signatories for not extending the same standards of equality to slaves. 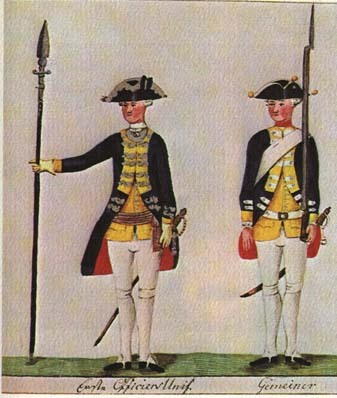 The Continental Army was put through a new training program, supervised by Baron von Steuben, introducing the most modern Prussian methods of drilling. Meanwhile, Howe resigned and was replaced by Henry Clinton on May 24, 1778. Clinton received orders to abandon Philadelphia and fortify New York following France's entry into the war. On June 18, the British departed Philadelphia, with the reinvigorated Americans in pursuit. The two armies fought at Monmouth Court House on June 28, with the Americans holding the field, greatly boosting morale and confidence. By July, both armies were back in the same positions they had been two years prior. The French blockaded the lucrative sugar islands of Barbados and Jamaica, intending to damage British trade. French troops led by the Marquis de Bouillé captured Dominica on September 7, 1778 in order to improve communication among French Caribbean islands and to strike a blow against privateering. 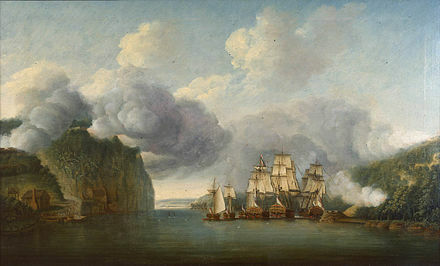 The British defeated a French naval force on December 15 and captured St. Lucia on December 28. 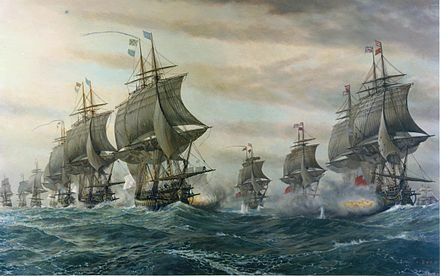 Both fleets received reinforcements through the first half of 1779, but the French under the Comte d'Estaing had superiority in the Caribbean and began capturing British territories,  seizing St. Vincent on June 18 and Grenada on July 4. The British fleet under John Byron was tactically defeated on July 6, having pursued d'Estaing from Grenada,  the worst loss that the Royal Navy had suffered since 1690. Naval skirmishes continued until April 17, 1780, when British and French fleets clashed indecisively off Martinique. The British East India Company moved quickly to capture French possessions in India when they learned about the hostilities with France, and they took Pondicherry on 19 October 1778 after a two-week siege. The Company resolved to drive the French completely out of India,  and they captured the Malabar port of Mahé in 1779  where French ordnance passed through. By March, Greene's army had increased in size enough that he felt confident in facing Cornwallis. 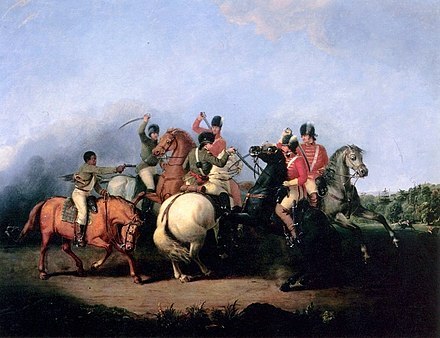 The two armies engaged at Guilford Courthouse on March 15; Greene was beaten, but Cornwallis' army suffered irreplaceable casualties. Compounding this, far fewer Loyalists were joining than the British had previously expected. Cornwallis' casualties were such that he was compelled to retreat to Wilmington for reinforcement, leaving the Patriots in control of the interior of the Carolinas and Georgia. Following the surrender at Yorktown, the Whig party came to power in Britain and began opening negotiations for a cessation of hostilities. While peace negotiations were being undertaken, British troops in America were restricted from launching further offensives. Prime Minister the Earl of Shelburne was reluctant to accept American independence as a prerequisite for peace, as the British were aware that the French economy was nearly bankrupt, and reinforcements sent to the West Indies could potentially reverse the situation there. He preferred that the colonies accept Dominion status within the Empire, though a similar offer had been rejected by the Americans in 1778. Negotiations soon began in Paris. The population of Great Britain and Ireland in 1780 was approximately 12.6 million,  while the Thirteen Colonies held a population of some 2.8 million, including some 500,000 slaves. Theoretically, Britain had the advantage, however, many factors inhibited the procurement of a large army. By 1781, the Army numbered approximately 121,000 men globally,  48,000 of whom were stationed throughout the Americas. Of the 171,000 sailors  who served in the Royal Navy throughout the conflict, around a quarter were pressed. This same proportion, approximately 42,000 men, deserted during the conflict. At its height, the Navy had 94 ships-of-the-line,  104 frigates  and 37 sloops  in service. 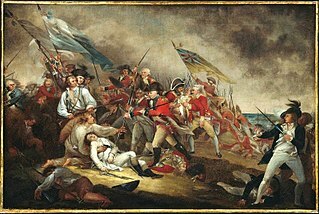 Black Loyalist soldiers fought alongside British regulars in the 1781 Battle of Jersey, from The Death of Major Peirson . Three current branches of the United States Military trace their institutional roots to the American Revolutionary War; the United States Army comes from the Continental Army, formed by a resolution of the Continental Congress on June 14, 1775. The United States Navy recognizes October 13, 1775 as the date of its official establishment, the passage of the resolution of the Continental Congress at Philadelphia that created the Continental Navy. The United States Marine Corps links to the Continental Marines of the war, formed by a resolution of the Continental Congress on November 10, 1775. However, in 1783 both the Continental Navy and Continental Marines were disbanded. 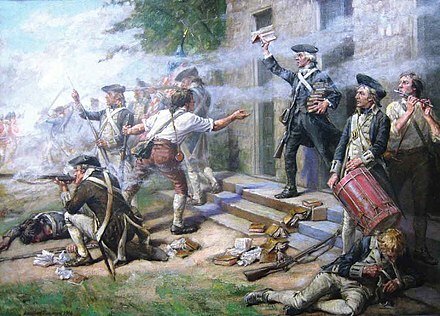 At the beginning of 1776, Washington commanded 20,000 men, with two-thirds enlisted in the Continental Army and the other third in the various state militias. About 250,000 men served as regulars or as militiamen for the Revolutionary cause in the eight years of the war, but there were never more than 90,000 men under arms at one time. Most American Indians east of the Mississippi River were affected by the war, and many tribes were divided over the question of how to respond to the conflict. A few tribes were on friendly terms with the other Americans, but most Indians opposed the union of the Colonies as a potential threat to their territory. Approximately 13,000 Indians fought on the British side, with the largest group coming from the Iroquois tribes, who fielded around 1,500 men. The powerful Iroquois Confederacy was shattered as a result of the conflict, whatever side they took; the Seneca, Onondaga, and Cayuga nations sided with the British. Members of the Mohawk nation fought on both sides. Many Tuscarora and Oneida sided with the colonists. The Continental Army sent the Sullivan Expedition on raids throughout New York to cripple the Iroquois tribes that had sided with the British. Mohawk leaders Joseph Louis Cook and Joseph Brant sided with the Americans and the British respectively, and this further exacerbated the split. ↑ This article primarily refers to the inhabitants of the thirteen colonies who supported the American Revolution as "Americans", with occasional references to "Patriots" or "Revolutionaries". Colonists who supported the British and opposed the Revolution are referred to as "Loyalists" or "Tories". The geographical area of the thirteen colonies is often referred to simply as "America". General William Howe, 5th Viscount Howe, KB, PC was a British Army officer who rose to become Commander-in-Chief of British forces during the American War of Independence. Howe was one of three brothers who had distinguished military careers. In historiography of the American war he is usually referred to as Sir William Howe in distinction to his brother Richard, who held the title of Lord Howe at that time. General Sir Henry Clinton, KB was a British army officer and politician who sat in the House of Commons between 1772 and 1795. He is best known for his service as a general during the American War of Independence. First arriving in Boston in May 1775, from 1778 to 1782 he was the British Commander-in-Chief in North America. In addition to his military service, due to the influence of his cousin Henry Pelham-Clinton, 2nd Duke of Newcastle, he was a Member of Parliament for many years. Late in life he was named Governor of Gibraltar, but died before assuming the post. 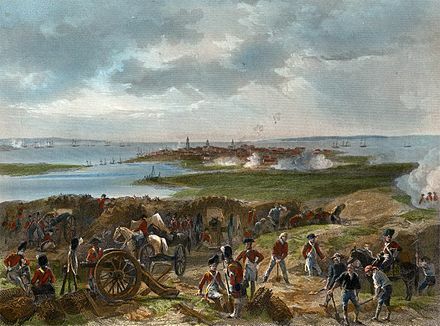 The Siege of Charleston was a major engagement and major British victory, fought between March 29 to May 12, 1780 during the American Revolutionary War. 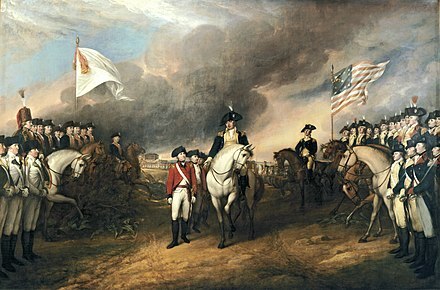 The British, following the collapse of their northern strategy in late 1777 and their withdrawal from Philadelphia in 1778, shifted their focus to the American Southern Colonies. George Washington commanded the Continental Army in the American Revolutionary War (1775–1783). After serving as President of the United States, he briefly was in charge of a new army in 1798. The Capture of Savannah, or sometimes the First Battle of Savannah, was an American Revolutionary War battle fought on December 29, 1778 pitting local American Patriot militia and Continental Army units, holding the city, against a British invasion force under the command of Lieutenant Colonel Archibald Campbell. The British seizure of the city led to an extended occupation and was the opening move in the British southern strategy to regain control of the rebellious Southern provinces by appealing to the relatively strong Loyalist sentiment there. Charles Cornwallis, 1st Marquess Cornwallis KG, PC, styled Viscount Brome between 1753 and 1762 and known as The Earl Cornwallis between 1762 and 1792, was a British Army general and official. In the United States and the United Kingdom he is best remembered as one of the leading British generals in the American War of Independence. His surrender in 1781 to a combined American and French force at the Siege of Yorktown ended significant hostilities in North America. 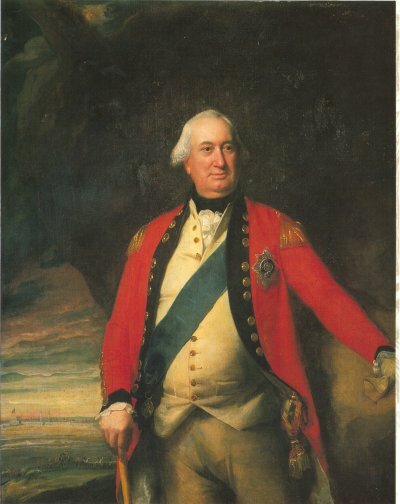 He also served as a civil and military governor in Ireland and India; in both places he brought about significant changes, including the Act of Union in Ireland, and the Cornwallis Code and the Permanent Settlement in India. Charles, Earl Cornwallis (1738–1805) was a military officer who served in the British Army during the American War of Independence. He is best known for surrendering his army after the 1781 Siege of Yorktown, an act that ended major hostilities in North America and led directly to peace negotiations and the eventual end of the war. 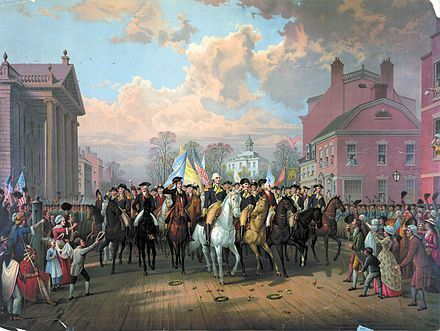 Colonists who supported the British cause in the American Revolution were Loyalists, often called Tories, or, occasionally, Royalists or King's Men. George Washington's winning side in the war called themselves "Patriots", and in this article Americans on the revolutionary side are called Patriots. For a detailed analysis of the psychology and social origins of the Loyalists, see Loyalist. 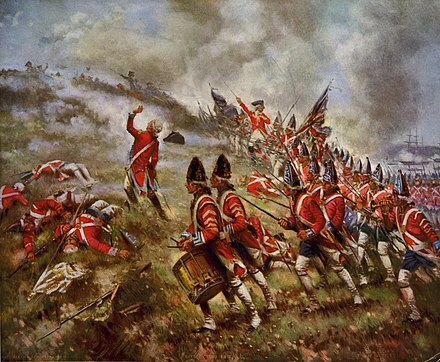 The British Army during the American Revolutionary War served for eight years in campaigns fought around the globe. 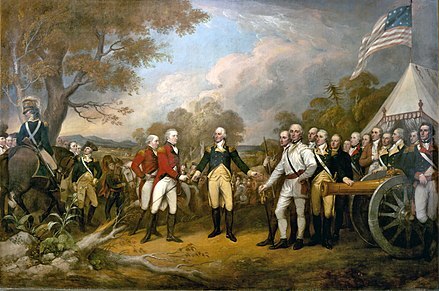 Defeat at the Siege of Yorktown to a combined Franco-US force ultimately led to the loss of the Thirteen Colonies in eastern North America, and the concluding Treaty of Paris deprived Britain of many of the gains achieved in the Seven Years' War. However several victories elsewhere meant that much of the British Empire remained intact. ↑ Lowell, Edward J (1884), "The Hessians and the other German Auxiliaries of Great Britain in the Revolutionary War", Harper and Brothers Publishers, New York, Chapter II. Quote: "Five battalions of the Hanoverian subjects of George III were despatched to Gibraltar and Menorca"
1 2 3 4 5 6 7 8 Duncan, Louis C. Medical Men in the American Revolution (1931). 1 2 Michael Lanning (2009). American Revolution 100: The Battles, People, and Events of the American War for Independence, Ranked by Their Significance. Sourcebooks. pp. 195–96. ISBN 978-1-4022-4170-3. 1 2 Jack P. Greene and J. R. Pole. A Companion to the American Revolution (Wiley-Blackwell, 2003), p. 328. ↑ Paullin, Charles Oscar (1906). The navy of the American Revolution: its administration, its policy and its achievements. The Burrows Brothers Co.
↑ "Privateers or Merchant Mariners help win the Revolutionary War". Usmm.org. Retrieved May 25, 2017. ↑ Chartrand & Courcelle 2006, p. 79. 1 2 Jonathan Dull, A Diplomatic History of the American Revolution (Yale University Press, 1985), p. 110. 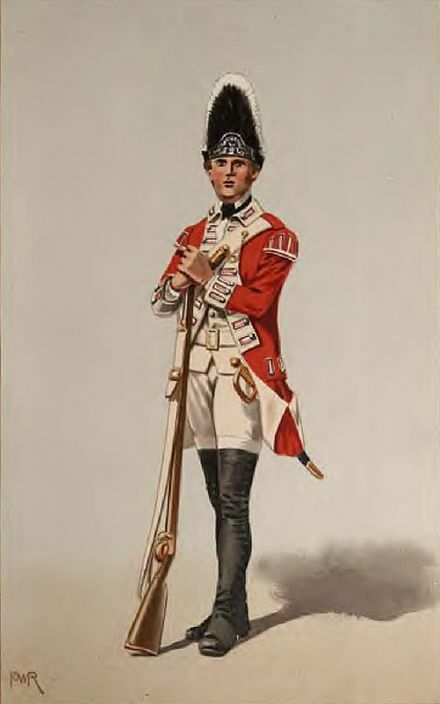 1 2 "Red Coats Facts – British Soldiers in the American Revolution". totallyhistory.com. 1 2 "The British Army 1775–1783" (PDF). orbat. Archived from the original (PDF) on September 27, 2013. Retrieved September 23, 2013. ↑ Chartrand & Courcelle 2006, p. 63: "Of 7,500 men in the Gibraltar garrison in September (including 400 in hospital), some 3,430 were always on duty"
1 2 Mackesy (1964), pp. 6, 176 (British seamen). 1 2 Howard H. Peckham, ed., The Toll of Independence: Engagements and Battle Casualties of the American Revolution (Chicago: University of Chicago Press, 1974). 1 2 Burrows, Edwin G. (Fall 2008). "Patriots or Terrorists". American Heritage. 58 (5). Archived from the original on March 23, 2013. Retrieved November 29, 2014. 1 2 Dawson, Warrington. "The 2112 Frenchmen who died in the United States from 1777 to 1783 while fighting for the American Independence". Washington-Rochambeau Revolutionary Route. Journal de la societe des Americanistes. Archived from the original on June 5, 2017. Retrieved June 4, 2017. 1 2 3 4 5 6 7 8 Clodfelter, Micheal (2017). Warfare and Armed Conflicts: A Statistical Encyclopedia of Casualty and Other Figures, 1492–2015, 4th ed. McFarland. p. 133. ISBN 978-0786474707. 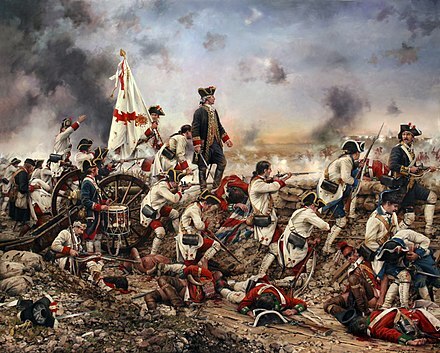 1 2 3 "Spanish casualties in The American Revolutionary war". Necrometrics. ↑ Otfinoski, Steven (2008). The New Republic. Marshall Cavendish. ISBN 9780761429388. 1 2 Annual Register, 1783 (1785), pp. 199–200. 1 2 Parliamentary Register (1781), pp. 263–65. 1 2 Parliamentary Register (1781), p. 269. ↑ Burrows, Edwin. "Forgotten Patriots: The Untold Story of American Prisoners During the Revolutionary War." Basic Books. New York, 2008. p. 203. ↑ Modern British writers generally favor "American War of Independence", rather than "American Rebellion" or "War of American Independence". "National Curriculum England" . Retrieved April 21, 2016. ↑ The colony of Georgia joined later. ↑ Gladney, Henry M. (2014). No Taxation without Representation: 1768 Petition, Memorial, and Remonstrance (PDF). Archived from the original (PDF) on May 13, 2015. ↑ Dickinson, H. T (1977). Liberty and Property: Political Ideology in Eighteenth-century Britain – H.T. Dickinson. p. 218. ISBN 978-0-416-72930-6 . Retrieved 2015-01-07– via Books.google.com. ↑ Charles Howard McIlwain (1938). The American Revolution: A Constitutional Interpretation. p. 51. ISBN 978-1-58477-568-3. ↑ Paul Boyer; et al. (2014). The Enduring Vision: A History of the American People. Cengage Learning. p. 142. ISBN 978-1-285-19339-7. ↑ "What was the Boston Massacre?". Boston Massacre Society. 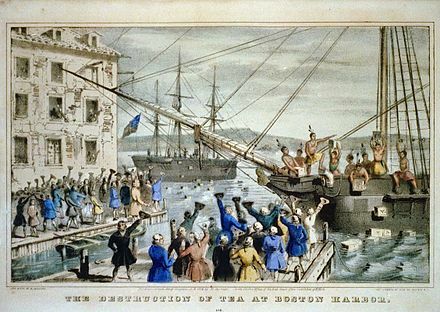 ↑ "Boston Tea Party". History.com. ↑ "Avalon Project – Great Britain : Parliament – The Massachusetts Government Act; May 20, 1774". avalon.law.yale.edu. ↑ Ian R. Christie and Benjamin W. Labaree, Empire or Independence, 1760–1776 (New York: Norton, 1976) p. 188. ↑ Ammerman, In the Common Cause, 15. ↑ Gary B. Nash; Carter Smith (2007). Atlas Of American History. Infobase Publishing. p. 64. ISBN 978-1-4381-3013-2. ↑ Peter Knight (2003). Conspiracy Theories in American History: An Encyclopedia. ABC-CLIO. pp. 184–85. ISBN 978-1-57607-812-9. ↑ Ferling, John. (2003). A Leap in the Dark. Oxford University Press. p. 112. ↑ Kindig, Thomas E. (1995). "Galloway's Plan for the Union of Great Britain and the Colonies". Declaration of Independence. Philadelphia, Pennsylvania, USA: Independence Hall Association, publishing electronically as ushistory.org. Archived from the original on April 2, 2015. Retrieved March 14, 2015. The plan was considered very attractive to most of the members, as it proposed a popularly elected Grand Council which would represent the interests of the colonies as a whole, and would be a continental equivalent to the English Parliament. After a sincere debate, it was rejected by a six to five vote on October 22, 1774. It may have been the arrival of the Suffolk County (Boston) resolutions that killed it. 1 2 Kramnick, Isaac (ed); Thomas Paine (1982). Common Sense. Penguin Classics. p. 21. ↑ Lecky, William Edward Hartpole, A History of England in the Eighteenth CentuIry (1882), pp. 449–50. ↑ John R. Alden (1989). A History of the American Revolution. Da Capo Press. pp. 188–90. ISBN 978-0-306-80366-6. ↑ Willard Sterne Randall, "Benedict Arnold at Quebec", MHQ: Quarterly Journal of Military History, Summer 1990, Vol. 2, Issue 4, pp. 38–49. ↑ Levy, Andrew (Jan 9, 2007). The First Emancipator: Slavery, Religion, and the Quiet Revolution of Robert Carter. Random House Trade Paperbacks. p. 74. ISBN 978-0-375-76104-1. ↑ Scribner, Robert L. (1983). Revolutionary Virginia, the Road to Independence. University of Virginia Press. p. xxiv. ISBN 978-0-8139-0748-2. ↑ "Declaration of Taking Up Arms: Resolutions of the Second Continental Congress". Constitution Society. Retrieved 2013-09-23. ↑ Maier, American Scripture, 25. The text of the 1775 king's speech is online, published by the American Memory project. ↑ Frank A. Biletz (2013). Historical Dictionary of Ireland. Scarecrow Press. p. 8. ISBN 9780810870918. ↑ Lecky (1891). A History of England. pp. 162–65. ↑ Vincent Morley (2002). 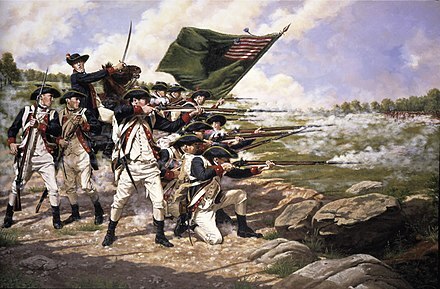 Irish Opinion and the American Revolution, 1760–1783. Cambridge UP. pp. 154–57. ISBN 9781139434560. 1 2 John C. Miller (1959). Origins of the American Revolution. Stanford UP. pp. 410–12. 1 2 Jackson, Lowell, Edward (July 23, 1884). 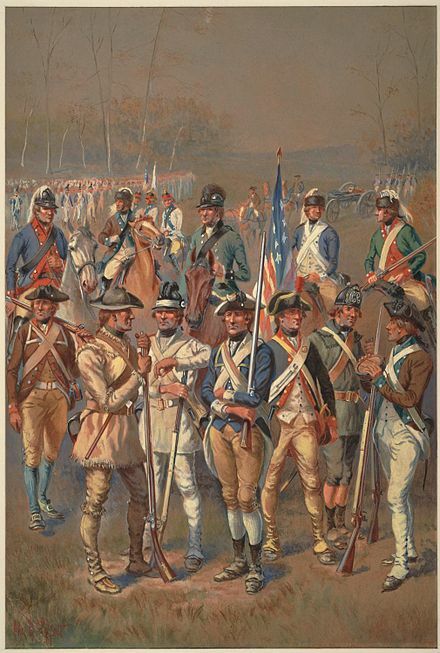 "The Hessians and the other German auxiliaries of Great Britain in the revolutionary war". library.si.edu. ↑ David Smith (2012). New York 1776: The Continentals' First Battle. Osprey Publishing. pp. 21–23. ISBN 9781782004431. ↑ Christie and Labaree, Empire or Independence, 270; Maier, American Scripture, 31–32. 1 2 3 Encyclopedia of American History. Richard B. Morris and Jeffrey B. Morris, eds., 6th Edition (New York: Harper & Row Publishers, 1982), p. 130. 1 2 Adams, Charles Francis, "Battle of Long Island", in American Historical Review (1895–1896), p. 657. ↑ Thomas J. McGuire (2011). Stop the Revolution: America in the Summer of Independence and the Conference for Peace. Stackpole Books. pp. 165–66. ISBN 9780811745086. 1 2 Fischer (2004), pp. 102–11. 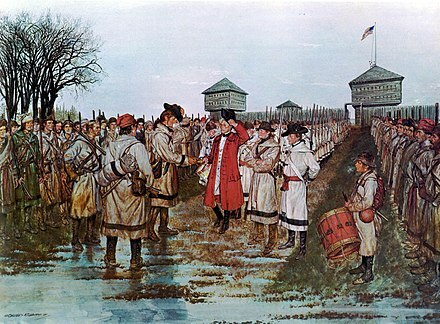 1 2 Barnet Schecter, The battle for New York: The city at the heart of the American Revolution (2002). 1 2 David McCullough (2006). 1776. p. 122. ISBN 9781451658255. 1 2 Stedman, Charles, The History of the Origin, Progress and Termination of the American War Volume I (1794), p. 221. ↑ Mary Tucker (March 1, 2002). 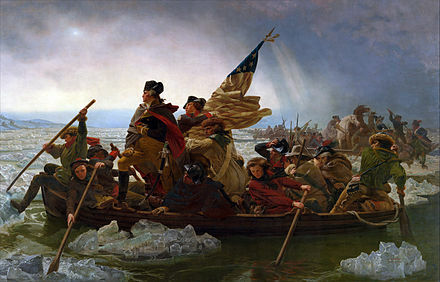 Washington Crossing the Delaware. Lorenz Educational Press. pp. 22–23. ISBN 9780787785642. ↑ Lecky (1891). A History of England. pp. 70–78. ↑ McCullough 2006 , p. 195. ↑ Fischer p. 254. Casualty numbers vary slightly with the Hessian forces, usually between 21–23 killed, 80–95 wounded, and 890–920 captured (including the wounded). 1 2 Lecky, William, A History of England in the Eighteenth Century, Vol. IV (1891), p. 57. ↑ Gabriel, Michael P. (2012). The Battle of Bennington: Soldiers and Civilians. The History Press. ↑ Ketchum (1997), pp. 337–78. ↑ Ketchum (1997), pp. 403–25. 1 2 Adams, Charles Francis. 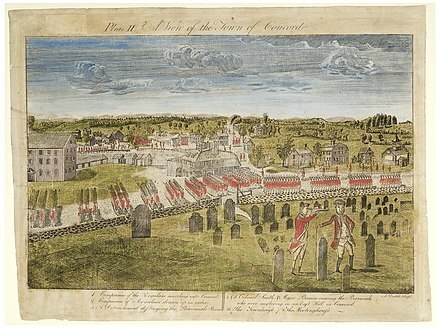 "Campaign of 1777", Massachusetts Historical Society, Vol. 44 (1910–11), p. 43. 1 2 Cadwalader, Richard McCall (1901). Observance of the One Hundred and Twenty-third Anniversary of the Evacuation of Philadelphia by the British Army. Fort Washington and the Encampment of White Marsh, November 2, 1777:. pp. 20–28. Retrieved January 7, 2016. 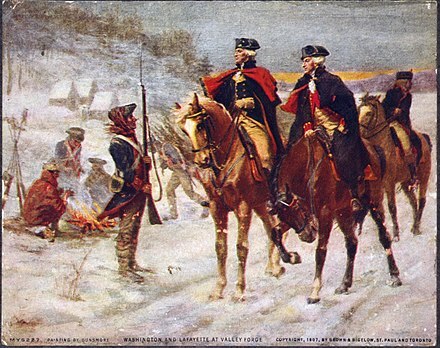 1 2 Noel Fairchild Busch, Winter Quarters: George Washington and the Continental Army at Valley Forge (Liveright, 1974). 1 2 "A Concluding Commentary" Supplying Washington's Army (1981). 1 2 "The Winning of Independence, 1777–1783" American Military History Volume I (2005). 1 2 Frances H. Kennedy (2014). The American Revolution: A Historical Guidebook. Oxford UP. p. 163. ISBN 9780199324224. ↑ Text incorporated from Valley Forge National Historical Park website, which is in the public domain. ↑ Reid, Authority to Tax, 51. ↑ Terry M. Mays (2009). Historical Dictionary of the American Revolution. Scarecrow Press. p. 7. ISBN 9780810875036. 1 2 3 Jones, Howard (2002). Crucible of Power: A History of American Foreign Relations to 1913. Scholarly Resources Inc. p. 5. ISBN 978-0-8420-2916-2. ↑ "Journal of the American Revolution, The Gunpowder shortage (September 9, 2013). ↑ James Brown Scott, Historical Introduction, pp. 8–9 in Samuel Flagg Bemis, Ed. The American Secretaries of State and their diplomacy V.1–2, 1963. ↑ "Springfield Armory". Nps.gov. April 25, 2013. Retrieved May 8, 2013. ↑ Georges Édouard Lemaître (2005). Beaumarchais. Kessinger Publishing. p. 229. ↑ Thomas G. Paterson; et al. (2009). American Foreign Relations, Volume 1: A History to 1920. Cengage Learning. pp. 13–15. ↑ E. Chavez, Thomas (1997). Spain's Support Vital to United States Independence, 1777–1783. United States. Dept. of Defense. pp. United States. ↑ Clarfield, Gerard. 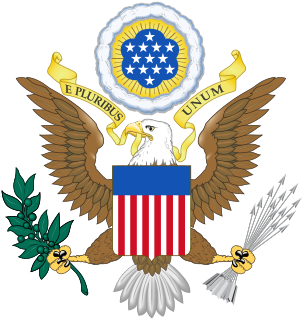 United States Diplomatic History: From Revolution to Empire. New Jersey: Prentice-Hall, 1992. ↑ Stockley, Andrew (1 January 2001). Britain and France at the Birth of America: The European Powers and the Peace Negotiations of 1782–1783. University of Exeter Press. p. 19. ISBN 978-0-85989-615-3 . Retrieved 28 August 2015. ↑ Chartrand, René (2006). Gibraltar 1779–83: The Great Siege. Osprey Publishing. p. 9. ISBN 978-1-84176-977-6. ↑ John Ferling (2007). Almost a Miracle: The American Victory in the War of Independence. Oxford UP. p. 294. ISBN 978-0-19-975847-0. ↑ Trevelyan (1912), vol. 1, pp. 4–5. ↑ Selig, Robert A; et al. (1999), "5, sect 3", Rochambeau in Connecticut, Connecticut Historical Commission, retrieved 7 December 2007 [ permanent dead link ]. ↑ "Bonhomme Richard". Dictionary of American Naval Fighting Ships . Navy Department, Naval History and Heritage Command . Retrieved 2 June 2017. ↑ Black, Jeremy (1992). "Naval Power, Strategy and Foreign Policy, 1775–1791". In Michael Duffy. Parameters of British Naval Power, 1650–1850. Exeter, UK: University of Exeter Press. pp. 95–120, here: p.&nbsp, 105. ISBN 978-0-85989-385-5 . Retrieved 12 April 2013. ↑ Boromé, Joseph (January 1969). "Dominica during French Occupation, 1778–1784". The English Historical Review. 84 (Volume 884, No. 330): 36–58. JSTOR 562321. ↑ James W. Raab (2007). Spain, Britain and the American Revolution in Florida, 1763–1783. p. 135. ISBN 978-0-7864-3213-4. ↑ "General Bernardo Galvez in the American Revolution". ↑ "History of Mahé". Archived from the original on December 30, 2013. Retrieved June 2, 2017. ↑ Dalrymple, William (1 October 2005). "Assimilation and Transculturation in Eighteen-Century India: A Response to Pankaj Mishra". Common Knowledge. 11 (3): 445–85. doi:10.1215/0961754X-11-3-445 . Retrieved 2 June 2017. 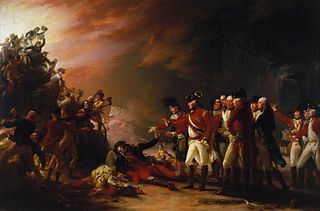 As late as 1780, following the disastrous British defeat by Tipu Sultan of Mysore at the Battle of Pollilur, 7,000 British men, along with an unknown number of women, were held captive by Tipu in his sophisticated fortress of Seringapatam. ↑ Hazard's Register of Pennsylvania: Devoted to the Preservation of Facts and Documents, and Every Kind of Useful Information Respecting the State of Pennsylvania, Volume 4. W.F. Geddes. 1829. p. 54. ↑ Eaton, Harry (1899). Jersey City and its historic sites. Jersey City, NJ: The Woman's Club. OCLC 6340873. ↑ Fischer, Joseph R. (2007). A Well Executed Failure: The Sullivan campaign against the Iroquois, July–September 1779. Columbia, SC: University of South Carolina Press. ISBN 978-1-57003-837-2. ↑ Alfred Creigh (1871). History of Washington County. B. Singerly. p. 49. ↑ Tolson, Jay (July 7–14, 2008). "How Washington's Savvy Won the Day". U.S. News & World Report. ↑ Jonathan Chandler, "‘To become again our brethren’: desertion and community during the American Revolutionary War, 1775–83." Historical Research 90#248 (2017): 363–80. ↑ Grenier, John. The First Way of War: American War Making on the Frontier, 1607–1814. Cambridge University Press, 2005. ISBN 0521845661, p. 159. Grenier argues that "The slaughter the Indians and rangers perpetrated was unprecedented." ↑ Gaff, Alan D. (2004). Bayonets in the Wilderness. Anthony Waynes Legion in the Old Northwest. Norman: University of Oklahoma Press. ISBN 978-0-8061-3585-4. 1 2 McGrath, Nick. "Battle of Guilford Courthouse". George Washington’s Mount Vernon: Digital Encyclopedia. Mount Vernon Ladies’ Association. Retrieved January 26, 2017. In three hours, Cornwallis’s army took possession of the field, but it was a Pyrrhic victory.... Cornwallis could not afford the casualties his army sustained, and withdrew to Wilmington. By doing so, Cornwallis ceded control of the countryside to the Continentals. ↑ Pancake, John (1985). This Destructive War. University of Alabama Press. ISBN 978-0-8173-0191-0. ↑ Reynolds, Jr., William R. (2012). Andrew Pickens: South Carolina Patriot in the Revolutionary War. Jefferson, NC: McFarland & Company, Inc. ISBN 978-0-7864-6694-8. 1 2 Cornwallis; An Answer to Sir Henry Clinton's Narrative. Note: Cornwallis wrote this pamphlet shortly after the war in explanation of his actions. ↑ Clinton, H.; The American Rebellion. Note: This lack of notification was one of Clinton's main arguments in his own defense in the controversy which followed the surrender at Yorktown. ↑ Middleton, Richard (2014). "Naval Resources and the British Defeat at Yorktown, 1781". The Mariner's Mirror. 100 (1): 29–43. doi:10.1080/00253359.2014.866373. ↑ Lewis Namier and John Brooke (1985). The House of Commons 1754–1790. p. 246. ISBN 9780436304200. ↑ Maj Gen Porter. History of the Corps of Royal Engineers. p. 208. ↑ "Bajas españolas de las baterías flotantes del ataque a Gibraltar el 13 de septiembre de 1782", Gaceta de Madrid (in Spanish), Todo a Babor, retrieved 11 March 2010 . ↑ Edler, F. (2001) . The Dutch Republic and The American Revolution. Honolulu, Hawaii: University Press of the Pacific. ISBN 0898752698. ↑ Black, Jeremy (1999). Warfare in the Eighteenth Century. London: Cassell. p. 141. ISBN 9780304352456. ↑ Castex (p. 315) calls this a French victory, on account of more severe damage to Hughes' fleet. Mahan (p. 566) does not explicitly designate a victor. ↑ Malleson, George Bruce (1884). Final French Struggles in India and on the Indian Seas. W.H. Allen. ↑ Naravane, M.S. (2014). Battles of the Honorourable East India Company. A.P.H. Publishing Corporation. p. 174. ISBN 9788131300343. ↑ Wilks, Mark. "Historical Sketches of the South of India, in an Attempt to Trace the History of Mysoor" (PDF). Retrieved 4 June 2017. ↑ Singh, Sarbans (1993). Battle Honours of the Indian Army 1757–1971. New Delhi: Vision Books. pp. 102–03. ISBN 8170941156. ↑ Vibart, H.M. (1881). The Military History of the Madras Engineers and Pioneers, from 1743 up to the present time (Volume 1). London: W.H. Allen & Co. pp. 158–159. Retrieved 3 November 2013. 1 2 Naravane, M.S. (2014). Battles of the Honorourable East India Company. A.P.H. Publishing Corporation. pp. 173–75. ISBN 9788131300343. ↑ Hasan, Mohibbul (2005). History of Tipu Sultan. Aakar Books. p. 21. ISBN 978-8187879572 . Retrieved 19 January 2013. ↑ Hasan, Mohibbul (2005). History of Tipu Sultan. Aakar Books. p. 24. ISBN 978-8187879572 . Retrieved 19 January 2013. ↑ Fortescue, John (1902). A history of the British army. Volume 3. pp. 483–89.